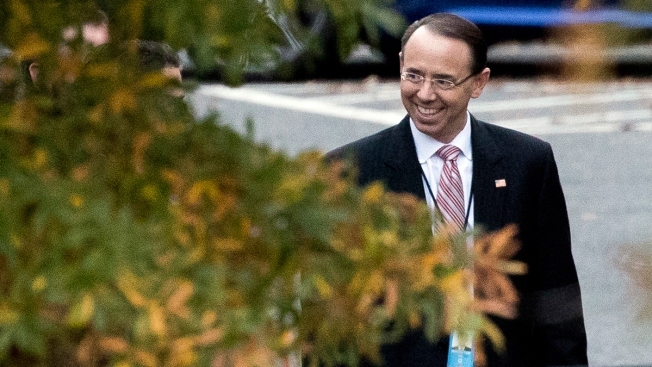 Rod Rosenstein waits for his car as he departs the West Wing of the White House in Washington, Wednesday, Nov. 7, 2018. Deputy Attorney General Rod Rosenstein will likely be stepping down from his position in about three weeks, NBC News reported, citing Justice Department officials. That word comes just days after William Barr was confirmed as the new attorney general by the Senate. Rosenstein, who has been overseeing special counsel Robert Mueller's investigation, said in January that he would leave shortly after the arrival of a new attorney general but that he would stay long enough to ensure an orderly transition.